I've been busy creating wedding invitations for my friend this week and I'm happy to say they are now ready for her to pick up. I have a video that shows how I made a favor box. That is the next step for the wedding. Be sure to follow me along this creative journey. I hope to make additional video's soon. The card today is for the challenge over at Artistic Inspirations. 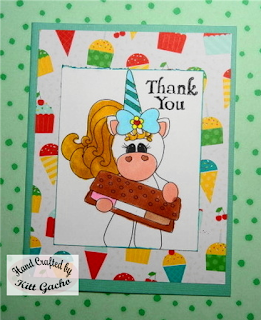 Be sure to stop by and see what the talented DT has for your magical inspiration with these cute images from Diddybag. Thanks for stopping by today and leaving your comments. I love hearing from you. Love your colors and layers on this cute card! Love the cute pony or is that a unicorn image! Fabulous coloring. Thanks for sharing with us at Cards in Envy! Most certainly cute and cuddly! Works perfectly for our cards in envy challenge. Take care! What a fun bright card to go with this cute image.Just love your perfect paper choices.Adorable.Thanks for joining us at Craft Your Passion.Hope to see you again next week. Super cute! Thank you so much for entering our ATG challenge at Through The Craft Room Door this week. We are looking forward to seeing you again in the next challenge.